I have been having a life long affair with clay. In harmony with my very practical nature I created colorful functional ware and architectural accents for over 25 years. But one day I gave myself permission to have fun. I went into my studio in 2004 and created my first figure in clay simply for the joy of working in a material that I know so well. 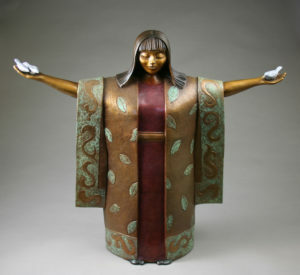 In 2006, urged by friends, I cast the first piece in bronze. Each new sculpture became a joy to me. My women are full and round and playful and thoughtful. My animals are quiet and companionable. I soon recognized that things that mattered to me crept into my work, stories that reflected human nature surrounded by our natural world. And though in the beginning I thought this work had no utility but to bring back to me the joy of process, I can now see that the stories that the pieces tell are their utility. And if my stories bring a little moment of peace or a smile, a little insight or a warm memory, then my work once again graces daily life. I have always lived in the Pacific NW. I received my education from grade school through a Masters degree in Portland. If I could say that I have a motto that I live by, it would be the words on a bracelet that I have worn for years…”follow your bliss”… the words of Joseph Campbell, an amazing teacher. Many Irish ballads tell the story of the maiden who walks the lonely windy shores of Ireland waiting for her love to come home. This work is about the waiting in all of us but with hope, for with this maiden is the crow… the symbol of magic. 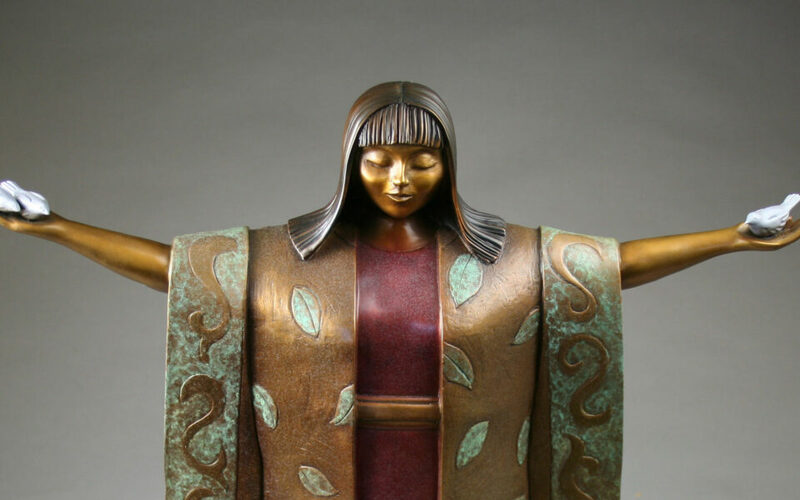 Bronze Sculptor Ann Fleming’s distinctive style has attracted a strong following, striking an emotional resonance with viewers . Fleming’s bronze sculptures tell the stories of our lives, are influenced by yoga, motherhood and her love of life and wine.